Looking for information on repairing cloth diapers? We've searched high and low for the best tips and tutorials, and even links to businesses that can help you to get your cloth diapers back to tip-top shape. 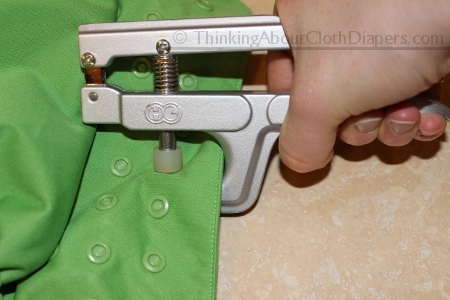 Whether you need to replace elastic or hook and loop, or repair snaps, or even if your little one has discovered how to take their hook and loop diaper off and you'd like to foil their attempts by converting your diapers over to snaps, we've collected information that will help you with repairing cloth diapers. Remember, altering your cloth diapers in any way will void their warranty. If your diapers are still under warranty, you should contact the manufacturer. They will ask for proof of purchase (invoice, etc), and will likely ask you to ship your diapers back to them for repair or replacement. When cared for properly, most cloth diapers will last well beyond their warranty period. If you are a bit handy, you can usually extend the life of your diapers even more with simple repairs. Usually, the first thing to wear out is elastics, and hook and loop tabs often lose their stick, too. A seam ripper - the red ones shown are my absolute favorite, but are hard to buy outside of Canada where Lee Valley Tools distributes them. They make removing elastic super easy! Pocket diapers usually contain elastic at the leg casings and back of the diaper. Have you ever pulled an old pair of underwear out of the bottom of your drawer and stretched it, only to feel stiffness and hear cracking? All elastic, over time, will wear out and lose it's shape. Often, diapers that were put away in great shape but stored for a few years will do the exact same thing as your old underwear. Exposure to high heat from machine drying and acidity from urine only compounds the stress on elastic. Even diapers that are hung to dry are subject to stretching. So eventually, now matter how well you care for your diapers, the elastics are going to need to be replaced. 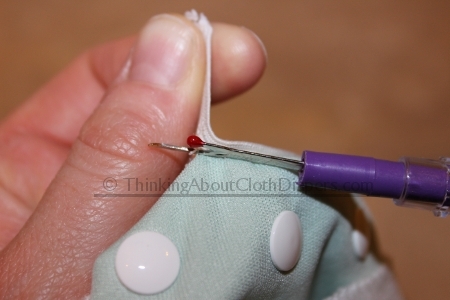 The simplicity of replacing the elastic on a diaper really depends on how it was constructed. There is a full range of diaper construction techniques, and each present their own nuances (and nuisances!) with replacing elastic. When elastic is fully stitched in, it is much harder to remove than when it is tacked in place only at the ends of the elastic casing. 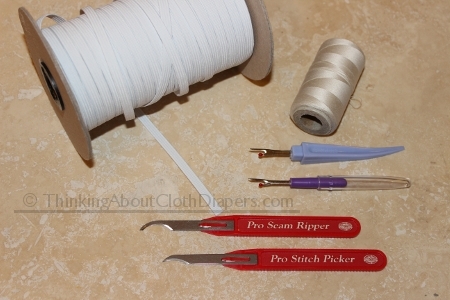 This Pro Stitch Picker from Lee Valley Tools makes quick work of elastic removal - simply slide the sharp blade along the elastic, being careful not to nick the PUL. When you buy replacement elastic, don't buy cheap, stiff elastic - it will impact the function of the diaper, and it won't hold up long. Look for high quality elastic, such as Lastin polybraid, or swimsuit elastics. Most diapers use 3/8" or 1/4" wide elastic, but measure if you're unsure. I've purchased this elastic from Wazoodle in the past and have been very happy with the quality and lifespan of it. Elastic from Wazoodle, along with a variety of seam rippers and stitch pickers. FuzziBunz has been the first brand to address the problems of elastic replacement. Here's a tutorial that shows how easy it is to replace FuzziBunz elastic. Please keep in mind that older versions of the FuzziBunz do not offer the same ease of replacing elastic. They can be replaced following this or other tutorials. Serged diapers often have the elastic stitched down the full length of the diaper. These diapers present more challenges, because they require a lot more picking apart to remove the elastic. 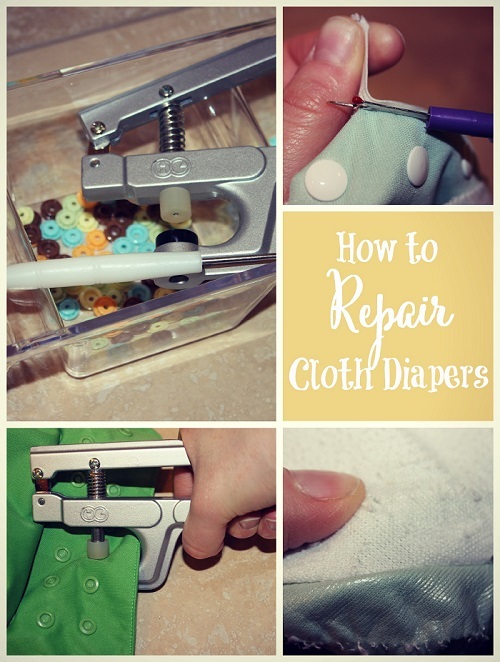 It can be hard to get the diaper to look exactly like new, but you can certainly take them apart and put them back together to get a functional diaper! 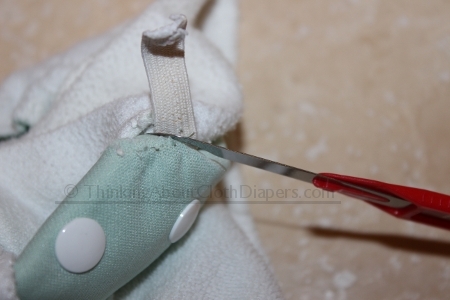 Here's how to open up a fitted diaper with serged edges to replace zig-zagged elastic. Diapers with sewn-in leg gussets, such as the Rumparooz One-Size Pocket, are also a fun challenge. They have 5 elastics (yes 5!) that will eventually wear out, but there is a way to replace them, too. Here's a video tutorial. The most popular hook and loop (i.e. Velcro) diapers are probably bumGenius. But over time, the tabs curl and the "landing strip" (the strip of loops sewn on the front of the diaper) becomes more fuzzy, losing its stick. The easiest way to repair these diapers is to remove the hook and loop components using a seam ripper (or "stitch picker") and convert them to snap closures using a snap press or snap pliers. If you want your snaps to match, KAM Snaps even offers BumGenius color snaps for all of the Flip and bumGenius diaper colors! Repairing snaps on a Flip cover - the snaps from KAMSnaps.com are a perfect match. We also like KAM Snaps' snap pliers and snap sets. They are an affordable way to repair a number of diapers, but if you only have one or two, you may find it less expensive to ship your diapers to someone who specializes in cloth diaper repairs. PS - If you never want to replace hook and loop tapes, you should definitely consider snaps. While they don't offer as much adjustability as hook and loop, they will hold up much longer. If you prefer the adjustability and ease of use that hook and loop offers, you may want to consider brands such as Bummis, TotsBots, and Rumparooz, which use some of the highest quality hook and loop tapes in the industry. If you have a broken or problematic snap that you need to remove, KAM Snaps has some suggestions here. Most pocket and diaper covers are made from PUL (polyurethane laminate). Heat is applied to a thin layer of laminate, which bonds it to the top layer. Sometimes, manufacturers get a bad batch of laminate that hasn't been bonded properly. While some wrinkling of the laminate can be expected during washing and drying, the results of delamination look very different. When delamination occurs, the laminate will start to lift off of the base fabric, creating big bubbles between the two layers. Delamination often spells the end of a diaper's lifespan if it happens outside of the warranty window. All brands have some issues with delamination, but many complain that this happens much more frequently with "China cheapies" such as Alva, where warranties can be hard to claim even if it happens in the first year. There is no way to repair diapers that have been delaminated. Some parents continue to use them in a manner similar to fitted diaper, stuffing them and placing another cover on top. Some charities will still take them, cutting them apart to use other components of the diaper in repairs to other diapers. Here is a photo of a delaminated diaper. PUL can also become cracked with time. As babies grow, the diapers are subjected to stretching, which can result in small cracks on the diaper, often nearest the front closing tabs. This usually isn't a prime spot for leaking, so the diapers may still be effective without repair. I did, however, find a detailed tutorial that attempts to re-waterproof PUL using the same spray-on waterproofing that is used to fix leaky tents. I have heard that this does work, but please do be sure to read about the safety of this spray before using it. I wasn't able to track down a can, and I would be concerned about exposure to fumes during application, and also about any problems that might result if you reheat the spray in the dryer. Repairing cloth diapers takes time and specialized materials. If that's just not for you, that's okay too! But even if you don't want to repair your diapers yourself when they have problems, don't throw them away! Here are a few options to extend the life of your diapers. Hire a small business to repair your diapers for you. (We offer a few links at the bottom of this article). While this will cost some money, you can usually have the repairs done by someone else for about the same cost as buying the diapers used - and definitely less than buying brand new diapers. Depending on the brand, paying someone to make necessary repairs can be worthwhile, especially if you can recoup the costs and then some by reselling the diapers. 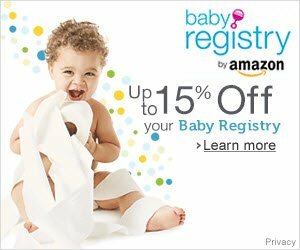 List your diapers on a resale site in a "Needs Repair" state. Depending on the popularity of the brand, you will be able to recover a small amount of money from them, or you can list them as "FFS" or "Free for Shipping". Keep in mind, be very clear about exactly what condition they are in and what needs to be repaired. You should not list diapers with delaminated or cracked PUL as these are, for the most part, impossible to repair. Donate them to a cloth diaper charity. Even in rough condition, your diapers could be a godsend for a family that is struggling financially. Charities often ask volunteers to help repair damaged diapers, and these diapers are then prepared for new families in need of cloth diapers. Even if you think your cloth diapers aren't worth repairing, there are ways that parts of them can be salvaged for other purposes. 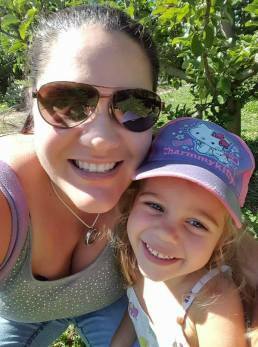 Here's a few ideas from Cloth for a Cause, the Canadian national cloth diaper charity, on how they use otherwise destroyed cloth diapers in new ways. Either send your diapers to them, or repurpose them for your own uses! I am not endorsing these businesses, as I have never tried any of them, but I did want to list them for you so you have a few businesses to start out with. A few reminders: make sure your diapers are clean before sending them. You may want to label them to be sure you get the right diapers back. Also, be sure to inquire about smoking, pets, or other concerns you may have. In the US, Convert My Diapers provides repairs and snap conversions. In Canada, Cloth for A Cause branch in Prince George repairs diapers in exchange for cash donations to help their cloth diaper charity efforts. GroVia also converts their hybrid shells to snaps for a set fee, which includes return shipping. Repairing your cloth diapers can be a rewarding job, because it means that you can make do with what you have, and extend the life of some of your cutest fluff! If you create a great photo tutorial or you know of a resource that would help other readers with their cloth diaper repairs, we would love to include it in this section.